The Fourth amendment of the United States Constitution, and Article One, Section Eight of the Pennsylvania Constitution protects people who live in the Commonwealth from unreasonable search and seizure of their homes and belongings by the police. In order for the police to be permitted to search your home or belongings, they must comply with certain constitutional requirements. 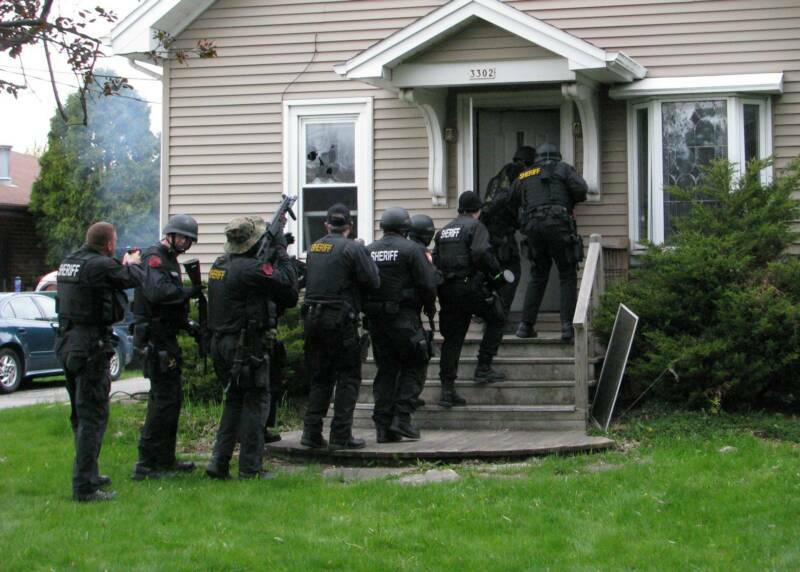 A valid search warrant requires a description of the place to be searched and the items to be seized. The warrant must describe with specificity and particularity the location and type of items to be seized, whether those items are drugs, weapons, or other contraband. A valid warrant must be signed by the authority that issues it. It should also state the name and department, agency, or address of the affiant. It should identify the owner or occupant of the place to be searched, and describe the crime which has been or is being committed and the facts and circumstances forming the probable cause necessary to believe that the items identified are unlawful and subject to seizure. It should also state why these items are expected to be in the placed to be searched. Timing of a search warrant matters. In Pennsylvania, a warrant may be authorized for a search during the daytime or the night time. For a warrant to be authorized to be performed during the hours of 10 PM to 6 AM, reasonable cause must be shown as to the necessity of a nighttime search. A night time search is deemed to be more intrusive into a person’s life, and an explanation of why a nighttime search is necessary is required to perform one. A search that commences in the daytime may spill over into the night if not finished, and a warrant authorized for a night time search may be performed during the day. However, if a daytime warrant is not executed until the night time, the items taken may be considered illegally seized, and the evidence potentially suppressed in a criminal prosecution against you. If you or someone you love are facing criminal charges or seriously injured in an accident in WV or PA, contact Attorney Frank Walker immediately at 412-532-6805 24 hours a day, 7 days a week for aggressive and experienced Criminal Defense or Representation in a Civil Case. Pittsburgh Criminal Defense Attorney Frank Walker of Frank Walker Law announces the launching of a new website focusing on Criminal Defense in Washington County Pennsylvania. The website, http://www.WashingtonPaCriminalAttorney.com will appeal to clients looking for a criminal defense attorney with experience defending summary, misdemeanor and felony cases in Washington County. While on the site, users have the opportunity to send a direct and confidential email regarding their case or contact Attorney Walker directly from their mobile phone with a “click to call” function. Additionally, potential clients can consult with Attorney Walker on cases where the government may opt to seek the death penalty in select homicide cases as Attorney Walker is certified Capital Counsel by the Pennsylvania Bar Association. If you or someone you love are facing criminal charges or seriously injured in an accident in WV or PA, contact Attorney Frank Walker immediately at 412-532-6805, 24 hours a day, 7 days a week for aggressive and experienced Criminal Defense or Representation in a Civil Case. 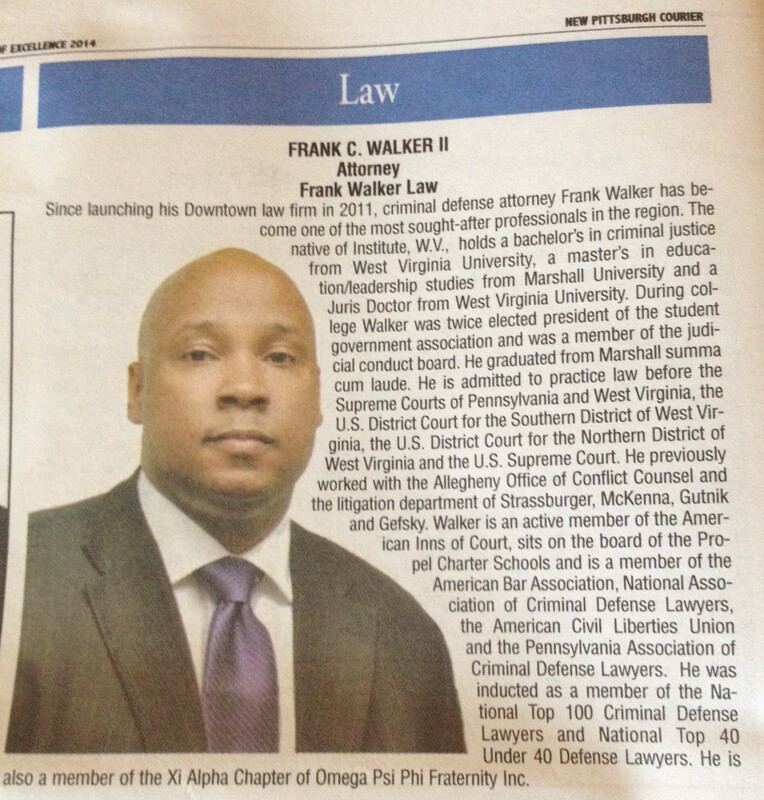 Pittsburgh Attorney Frank Walker of Frank Walker Law was recently chosen as one of the New Pittsburgh Courier’s Top 50 Men of Excellence for 2014. Attorney Walker was selected for his work in the area of Law and his commitment to community service in the Pittsburgh Community. Attorney Walker is a graduate of West Virginia State University, Marshall University, West Virginia University and is the owner of Frank Walker Law where he represents Criminal Defense and Personal Injury Clients. Attorney Walker is licensed to practice law in all Federal and State Courts of Pennsylvania and West Virginia. With offices in downtown Pittsburgh and Morgantown, West Virginia, Attorney Walker is frequently the attorney of choice for criminal defense matters and serious personal injury matters in Western Pennsylvania and Northern West Virginia. Additionally, Attorney Walker is often asked to sit on various Continuing Legal Education Panels for discussion on recent updates in the law. Attorney Walker was honored at an awards ceremony sponsored by the New Pittsburgh Courier and held at the Fairmont Hotel on July 24, 2014. A man has been arrested for allegedly stabbing his girlfriend’s son to death in Fineview. 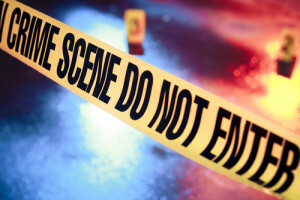 The criminal complaint filed about the incident stated that the 43-year-old suspect stabbed the 22-year-old victim inside his mother’s home during an altercation between the two men. 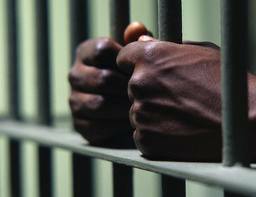 The woman stated in the complaint that she and the suspect had been dating for the last eight months and that over the last three months he had begun a pattern of physically abusing her. According to the complaint, one of the instances of abuse had the man kicking the woman and stomping on her leg then throwing her violently to the ground and searing her abdomen with the lit end of a burning cigarette. She stated that the suspect had left the home on Saturday night to go out and returned early Sunday morning. When he arrived, he told her that their relationship was over and began packing his things. She said that he then started choking her and then left the house. He left the room that they were in and returned a few minutes later holding a bloody butcher knife, telling her that she was next. She managed to escape the room and found her son lying unresponsive near a door. The suspect is faced with charges of assault and criminal homicide. These kinds of cases can often be difficult and complex. Due to the emotionally charged nature of the incident, and the vested interest of the witness -the mother – the defense will likely attempt to call her version of events into question. Also, it remains to be seen if there was any self-defense motive in the alleged killing. Is a Text Message enough Proof for Guilt in #Pittsburgh #Homicide case? In February of this year, in a house in Worth Township, a 21 year old woman was discovered by her mother after having died from an overdose of heroin mixed with fentanyl. Her death was not the only death in the area from this particular batch of heroin which was labeled ‘Theraflu’. Paramedics advised the police that they had found drug paraphernalia at the scene, including a syringe and the bags the drugs came in. In addition, the coroner’s report confirmed that both heroin and fentanyl were found in her body. After finding a text message from a man to her deceased daughter, in which he advised the woman that he had ‘Theraflu’ for her, the woman’s mother contacted the police. The man was arrested in connection with the overdose and is currently in Butler County Prison on a $100,000 bond. Police are understandably very concerned about the deaths related to this very dangerous drug cocktail. But, in a case like this, it is important to remember that the alleged text message advising the woman that the man had ‘Theraflu’ for her is not the same as having provided the woman with the drug. The officials first need to connect the message to the man’s phone, prove he is the one whom sent the message and proved that she in fact received the dangerous drugs from the man that caused her death.